Home > Blog > Delicious French mountain food…but not in the mountains! We have been dying to talk about mountain restaurants that serve hearty winter food for months. Now that it’s November, it seems like a great time to mention them! Although, having said that, we’re not feeling too chilly just yet. In fact, we’re enjoying a very warm start to the winter here in Burgundy. Here’s a pic from a walk in the Puisaye region (50 mins from our base) taken last Sunday…we were in T-shirts! 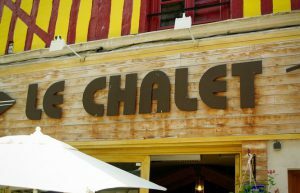 Most Alpine/Savoyarde restaurants – you know the sort that serve comfort food to skiers, like Raclette and Fondue – are, as you would imagine, usually located in ski resorts. However, there are an increasing number appearing in towns and cities dotted all around France. Mountain fare just has to be the perfect winter food and we are lucky enough to have a gem of a ‘mountain’ restaurant in our local non-mountainous town of Sens. Anyone hiring a campervan from us this winter really should pay them a visit. “Le Chalet” is tucked away down an alley near Sens Cathedral and offers authentic Savoyarde dishes at a very reasonable price, with friendly service too. If you are coming in the summer they change to menu to lighter dishes, still with a mountain theme, so well worth a visit at any time of the year. No time to visit but still feeling like some mountain food? 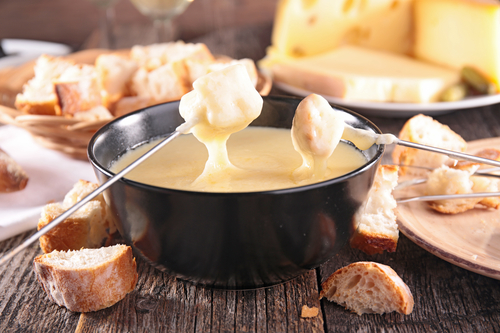 Most French supermarkets stock a ready-made version of fondue recette savoyarde, not the same as the real thing, of course, but with some fresh, crisp baguette torn into mouth-sized pieces it will at least put you in the mountain food mood! ← Easiest ever Tour de France route to follow in a campervan!